SHOULD I USE A SAFETY RAZOR? An increasing number of wet shavers are now shaving regularly with a traditional double edge safety razor — a shaving routine our fathers and grandfathers would have experienced in decades past. While a 3 or 5 blade cartridge system will consistently offer an excellent close shave — especially when replenishing the cartridges on a regular basis — using a traditional double edge safety razor can be much more worth while than simply following a fashionable grooming trend. Shaving with a sharp clean double edge blade is much less likely to clog with beard hair, shave cream and bacteria — the ingredients of mild skin irritation and razor burn. 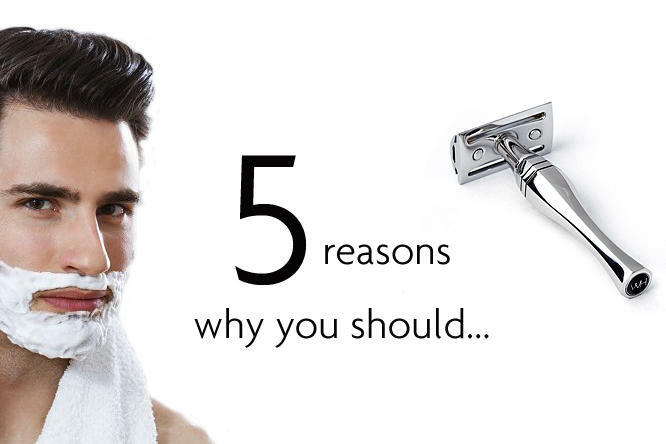 Rinse the safety razor blade regularly during the shave to ensure a clean, smooth outcome. Shaving with a sharp clean double edge blade will also help prevent ingrowing beard hairs and restrict the bacterial infections that can cause acne. Shaving with a double edge blade is very frugal indeed. A few double edge razor blades cost only a few pence to buy, a fraction of the price of a single 3 or 5 blade cartridge. Wet shaving with a safety razor also has a positive impact upon the environment. Double edge blades can be manufactured very efficiently compared to engineering the necessary components used to assemble blades in plastic cartridges. Note: It is recommended to change your double edge blade after 5-7 shaves. Double edge safety razor blades are available at leading UK supermarkets and pharmacies. Purchased in packs of 10. Which Safety Razor should I Buy? Wilde and Harte offer a choice of two aesthetically stunning safety razor designs, comprising of optimum weighted hand polished stainless steel handles. Each razor is equipped to offer a very close and comfortable shave over many years, yielding a very enjoyable wet shaving experience. Learn more about the Art Deco inspired 'Eltham' safety razor, or the contemporary and elegant 'Osterley' safety razor.